To say this resonated with me is an understatement. The details were different, but the essence of her life’s journey—how it began on one path and then took a series of twists and turns to set her down on a completely different one—is one I am most familiar with. I, too, was once that arrogant (read: young and naïve). My own journey began on a train platform in New Haven, CT, when I left for the USAF. My ultimate goal was to get my degree and parlay the skills and connections I was making in the military into a job in foreign relations or politics. I was on the express train to a career in public service of some type. Then I met my husband. Love put me on a different track, one with a similar destination, but at a slower pace. Because if you stay on an express, there isn’t much room for a passenger. I wanted to take him along for the ride. The slower train took me on a great adventure overseas. 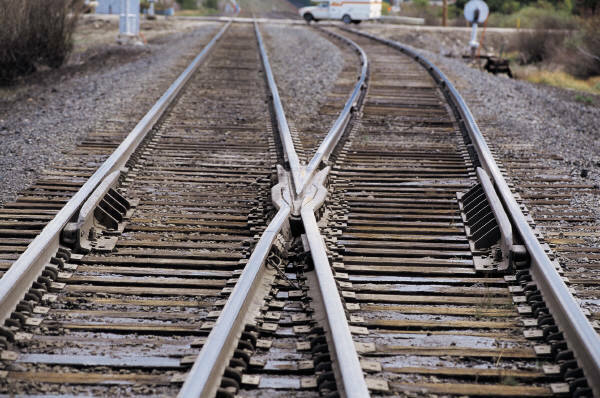 And it was at a stop in Germany that I faced my first hard decision and my first track obstruction. I was encouraged by my professor to apply for a Fulbright Scholarship. But if I were awarded one, it would mean spending another year in Europe while my husband returned to the US, since he was separating from the military. There was also my stepchildren, who lived with their mom in the US, to consider. We both had to work to ensure benefits for them. Financially and pragmatically, it just didn’t seem feasible. So I filed away the letter of recommendation and hopped back on the train. At the same time, I was trying desperately to start a family of my own with my husband. I grew up believing that women were supposed to be able to have it all—career, kids, contentment, and fulfillment. I was already on the career train, it was time to hook up the kiddie caboose. Six miscarriages later, I returned to the US with a handful of degrees, a great starter job at the State Department, and a painfully barren womb. My husband and I settled into a new home close to his children, though it was a two-hour commute to DC. My job wasn’t perfect, but it was a foot in the door that provided advancement opportunities. The kiddie caboose remained unoccupied, but we continued chugging along. 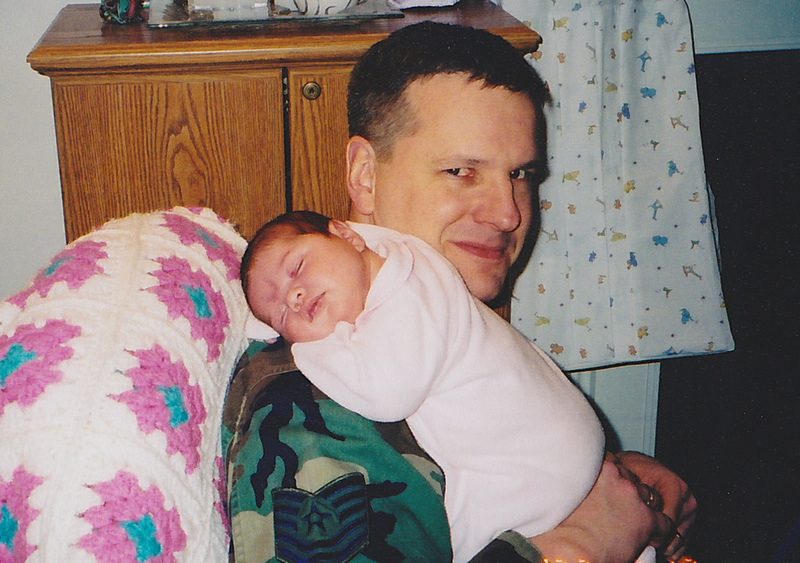 My husband holding our baby girl shortly before deploying in support of "Operation Iraqi Freedom" in 2003. …until the first cow wandered onto the track and we crashed into it. The Iraq War began while I was on maternity leave. My husband was recalled to active duty and shipped out the week I was supposed to return to work. Instead of getting back to my career, I went in for two weeks to clean out my desk. It was my choice to resign, but in many ways, it was no choice at all. I couldn’t find affordable daycare close to work, and having her someplace close to home meant dropping her off at 6:00 a.m. and picking her up at 7:30 p.m.—if the commuter rail was running on-time. My career train seemed permanently derailed. A few years later, I tried to board another locomotive heading in the same direction, but though the panel I interview with was gracious, it was obvious I was on the wrong platform. In the meantime, I hopped on a few trolleys that helped pay the bills and provided interesting scenery. I gained new skills. I invited another passenger onto the kiddie caboose. At one point, I even drove my own train. Owning my own online retail business was rewarding, and I thought perhaps I had found the track I was meant to be on. For various reasons, I decided to close down the business. Around the same time, I realized I had one last chance to use my remaining GI Bill for grad school, so I enrolled in a master’s degree program. I was now on a completely different train, and despite the added weight in back, (we had added one more to our brood) I was crusing right along. Master’s Degree and then an adjunct faculty position at the local community college were in my sights. But have you any idea how difficult it is to research and write a thesis while working part-time and raising a family? My husband, bless him, tried to help. But since the war, he had remained on active duty in a high-pressure job, which meant his first duty was to his country. It was another choice I made, regretfully, but I had to let it go. I couldn’t complete the thesis in time. I suppose I could have continued to plug away at it, but my locomotive was losing steam. And then I was pregnant again, this time without trying. Maybe some other time I will go into details as to all the reasons why she is definitive proof to me that there is a God, but let me just say that it was her birth that’s made me finally stop trying to plan anything. You know that saying…“Man plans, God laughs.” He laughs heartily at me. I don’t know where my train is going to take me next year or the year after that. I don’t even know where I’m going next week, to be honest. But for right now, I’m just going to sit back and enjoy the ride. I’m taking what was once just a hobby and treating it like a calling. I’m enjoying my fellow passengers on this journey as companions, instead of just dragging them along for the ride. I’ve spent too much time crying over missed trains and second-guessing travel routes. I’ve given up trying to make my life conform to the plan I had in my head, because that sort of inflexibility only invites heartache. I have a career and kids and contentment and fulfilment. It may not be exactly the way I envisioned, but it’s here, right in front of me. Maybe I ended up on a slow and meandering path to get where I am, but if I’d stayed on that express, I would’ve missed out on all those weird and wonderful moments that make up this thing called living. And that would have been the real tragedy of this journey. That is a thought-provoking post. Thank you! I think we will have fun. Looking forward to discovering new blogs to read, too.